If you haven’t played Plants vs Zombies yet, you’re missing out on something crucial and awesome in life. The game was first released way back in 2009 for Windows and OS X, and began to be released to the mobile platforms the following year from the iOS to Xbox Live Arcade, Nintendo DS, PSN, etc. and on the Android in 2011. The game is goofy and it’s downright hilarious. And it’s one of the most fulfilling and oftentimes relaxing casual game I’ve ever played. And its mechanics, much like a tower-defense game, is awesome. The premise is also very goofy. It’s Crazy Dave’s house. And it’s being invaded by hordes of zombies. The only thing that’s left standing between the house and the zombies are plants. Thus the name, Plants vs Zombies. You start off with simple plants such as the sunflower that generates sunlight with which you place new plants on the yard. Zombies begin to come in bigger hordes as the game progresses but your arsenal of zombie-destroying plant-life also grows as you go further and further into the game. Ranging from simple peashooters to cherry bombs, the variety of plants are endless and it’s a lot of fun to try to experiment with different things. 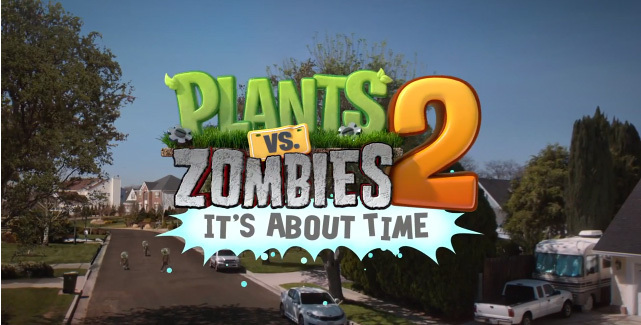 Four years after the original release, PopCap has finally announced the release date of Plants vs Zombies 2: It’s About Time. And that date is July 18th for the iPhone, iPad and iPod touch. And that’s a sore point right there. I sincerely hope that they release their desktop counterpart very soon unless they want to deal with a horde of countless gamers, who boosted the game to its popularity before being ported for the mobile and console. PopCap has said that “new ways to play the game will be released on an ongoing basis”. It seems that they’ve taken a very touch-screen interface oriented direction for this game. It makes sense to target the mobile market as that is pretty much the biggest market for casual games right now.